I know I've written quite a bit about skincare to give the skin a glow as of late, but that really is all I'm after in my skincare. The lab I now work in, along with my new apartment, are so, so dry and they leave my skin totally dull and tight if I don't start taking care of my skin the minute I wake up. 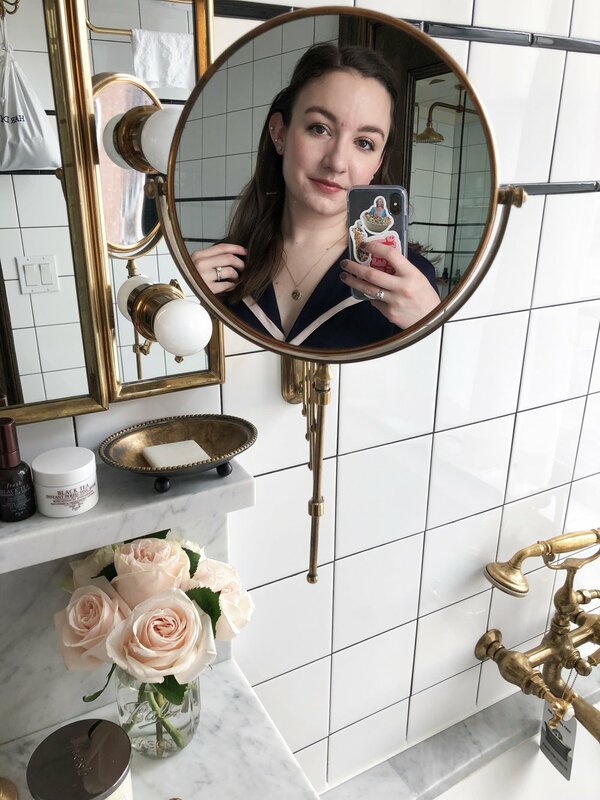 I've recently fallen into a routine that really seems to be helping me get my glow on. The newest addition to this lineup is the Glossier Milky Jelly Cleanser. I just got this last week, but oh man I can already tell it's a winner. Like all the other products I'm constantly raving about from them, this really does kickstart that glow. The name is totally accurate - it comes out as a gel, but it's a creamy, milky gel that doesn't strip the skin in the slightest. My skin feels oh so clean after this, but still incredibly moisturized and soft. I never feel any tightness at all after using this, and that's saying something - even the cleansing balms I've used leave my skin feeling a little tight if I don't moisturize immediately after. It's just so gentle so it's absolutely perfect for a morning cleanse (although it is pretty great at removing makeup at the end of the day too). The next step that's a necessity for me is a few quick spritzes of a face mist. It really wakes me up, and I don't know if this is a thing but I feel like the serum and moisturizer work better if I put it on slightly damp skin. The two I've been reaching for most lately are the Herbivore Botanicals Rose Hibiscus Coconut Water Hydrating Face Mist when my skin is feeling angry, and the Tatcha Luminous Dewy Skin Mist when I'm feeling more dry. The rose in the Herbivore Botanicals mist really helps to calm my skin down and feels really refreshing throughout the day, and the Tatcha is basically a liquid moisturizer - this stuff is amazing. You know my serum of choice lately because I wrote a review on it last week - the Dr. Jart+ Ceramidin Liquid. I've found this does an amazing job at keeping my skin moisturized for longer periods of time, which is excellent because of the constant dry conditions I'm in. The last step of my morning routine is moisturizer, and again, I've got two choices I typically rotate between. The Glossier Priming Moisturizer has pretty much reached holy grail status for me by now (as much as I hate that phrase), and it's the one I reach for without hesitation if I've got any redness or dullness hanging around. If I'm wanting something a tad more moisturizing I'll go for the Kate Somerville Goat Milk Cream. This is such a great everyday moisturizer - it feels really soothing and nourishing, but it's also quite lightweight and works well underneath makeup. I'm always amazed at how much it plumps up and smooths the skin, and I love that it's very slightly exfoliating because of the lactic acid content. By the time I've sped through these four steps, I'm looking considerably more awake and ready for the day. What are your go-to morning skincare products?